Highest road in Europe . . . by a good stretch! Cycling Pico de Veleta - a top world bike climb. THE NUMBER FOUR MOST DIFFICULT CLIMB IN THE WORLD. It is not often that we are blessed to climb “The” of anything, whether it be the “hardest,” the “longest,” the “steepest,” or, in this case the “highest.” Yet we can honestly claim that Pico is a “The” climb: The highest paved road in all of Europe -- now that’s saying something! And it’s not just high, it’s H A R D! Road above the rest stop - Pico Veleta Summit top of photo. Pico de Veleta had been considered for Spain’s Grand Tour (Vuelta a España) for 2017, but this never occurred. It does not appear that Pico Veleta has ever been included in the Vuelta a España. PJAMM’s Brad Butterfield climbed the most difficult (#4 World) route to the top on August 2, 2018. This was the last of Brad’s Top 10 World Climbs - got em all! While climbing Pico de Veleta is of itself a special experience, it was even more so on this day -- this was Brad’s last climb of the Top 10 World’s Highest Ranked Bike Climbs: 1. Mauna Kea (USA; December 2013, May 2018); 2. Scanuppia (Italy; July 2018); 3. Death Road (Bolivia; September 2017); 4. Pico de Veleta (Spain; August 2018); 5. Rila (Bulgaria; June 2018); 6. Mount Etna (Sicily, Italy; July 2018); 7. Rionda (Switzerland; June 2018); 8. Passo della Forcello (Italy; July 2018); 9. Alpe Fuori (Italy; July 2018); and 10. Breithorn (Switzerland; July 2018). You can follow along on Brad’s Blog as he tracks his path through Europe and the Balkans for 4 ½ months in the summer of 2018, documenting 200+ climbs for PJAMM. Pico de Veleta (Pico) from GR-3200, beginning at the eastern tip of Canalase Reservoir, is an absolute monster -- there can really be no debate about it. The first 2.7 km are murderous, even our SAG vehicle had a very tough time making it up the hill. There is a race on this road for the first 2.7 km and .25 km markers (see Alto de Haza Llanas KM marker slideshow) that never read below a 17% grade (and for one stretch document a 22% grade). We are on the highest road in Europe by about an astonishing 600m/~2,000 feet (3% less oxygen for every 300m/1000 feet -- do the math on that one -- huff and puff!). We ride through an alpine setting for about 3 kilometers beginning at km 7. Thereafter, the views are wide open and spectacular. Because the mountains are so steep and there are no visual obstructions for the last 20 kilometers, we have unobstructed views of Pico de Veleta as well as the Granada Province to the northwest as we climb. The final 11km (7 miles) is past a gate (only hikers and cyclists after this point) and up through Sierra Nevada Ski Station, which has been host to World Cup Races and is the highest ski resort in Spain. Should have brought MTB shoes . . . Located in southern Spain’s Andalusia region, at the foot of the Sierra Nevada mountains and the confluence of four rivers, Granada is an extraordinary Spanish city which features the famed Alhambra, a Moorish palace and citadel. Though the city’s elevation is about 2,400 feet above sea level, it’s less than an hour by car from the Mediterranean coast. Drawing two million visitors a year, the Alhambra is certainly a major tourist destination, and there’s no question why. Originally built in 889 AD on the remains of Roman fortifications, and subsequently restored from ruins in the mid-13th century, it was then converted into a palace in 1333, and by the 1490’s had become the royal court of Ferdinand and Isabella. This sprawling citadel is actually the site of Christopher Columbus’ royal endorsement for his 1492 expedition. A trip to Granada truly feels like you’re walking back in time. Alluding to the citadel’s luminous color in juxtaposition to the wooded area surrounding it, Moorish poets have described the Alhambra as “a pearl set in emeralds,” and it’s not one you’ll want to miss. Granada was the last stronghold of the Spanish Moors, and their influence can be seen all around the city which houses 13th to 15th century Moorish palaces and gardens, featuring Islamic architecture in the sweeping views of red roofs, horseshoe arches, and bright tile details. And the Arab influence isn’t limited to the architecture, finding tea, sweets, and hookah lounges couldn’t be easier in Granada. The city has deep cultural roots, having been home to poet Federico Garcia Lorca, painter Jose Guerrero, composer Manuel de Falla, and many others whose legacies live on in this vibrant mountain escape. And if all this isn’t enough to make you want to go for a visit, consider this: Granada is one of the few cities left in Spain which offers free tapas with every drink! Ties at the highest point by bike in Europe. At 3,398 meters (11,148 feet) above sea level, the Pico Veleta is Europe's highest paved road and consequently Europe's highest cycling climb. The road is a dead-end, though you can go down via the south side’s gravel path, requiring a mountain bike. This is precisely why the climb has never actually been featured in the Vuelta Espana: it's simply too long, too high and too tough for a Grand Tour. 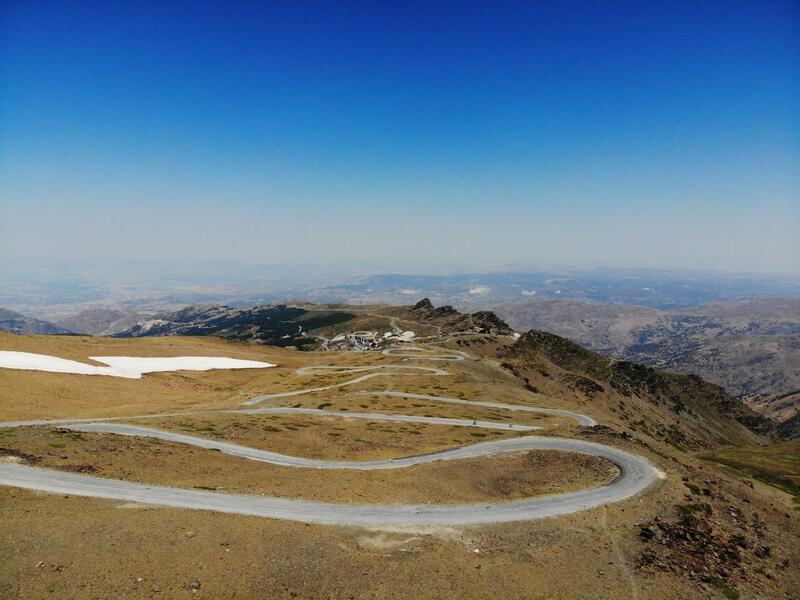 Though the climb to the Sierra Nevada Ski Station has often been featured in the Vuelta, it has never gone beyond the barrier at Hoya de la Mora at some 2,500 metres above sea level. • Hoya de la Moya is the last place to refuel, so if you're running low it's advisable that you use this opportunity to refill. • Altitude really starts to kick in from here on in. • The final 8km are at an average of 8%. • Cenes de la Vega (southeastern edge of Granada): (43km - 2700m) This is the main route that follows the A-395 to Hoya del la Mora (click here) -- PJAMM alternate route for August 2018 climb (Map - see also our Climb Page Slideshow for Pico Veleta from Granada). • Pinos Genil: (41.5km - 2747m) Much like the Cenes route above, however, this route is slightly shorter and steeper and avoids the main road for much of climb (click here). • Monachil: (37.5km - 2723m) This route is a little more interesting than the two above and throws in an extra climb to make things a little more difficult (click here). • Güéjar Sierra: (43.2km - 2836m) The route via Güéjar is so tough it will make you question your love for cycling (click here; this is the route featured on the PJAMM Cycling site). From the latter we have calculated that if you start from the beginning of the Alto Haza Llanas (from Guejar Sierre) you have 31.2 km of 7.7% average gradient going up +/- 2400m, making it one of world’s most unique and hardest climbs. My ride was in June 2016 with two friends. The weather conditions were excellent, not too warm and with a great skyline. The Alta Haza Llanas is the start with directly steep climbing with parts of 15%; the first 4km are the toughest and average 11%. The good news is it will not get harder than this to the top of the Veleta. The hairpins of the Alto Haza Llanas are tricky because in the corners they get steeper. After Haza Llanas you follow the road up to the Pradollano/Alto de Sierra Nevada. There is hardly any traffic and amazing views in this section of the climb. At the Hoya de la Mora before the barrier we had a “tortilla” (Spanish omelette) and some coca cola for sustenance to get us up the last 13km with 26 hairpins. The payoff was great views of the Sierra Nevada. The road of the last 13km is good except for the last 1km, which is dirt and snow covered if you’re there before June. A must do climb to champion Europe’s highest paved road. Cycling the great Pico de Veleta - the most difficult bike climb in Spain and 4th hardest in the entire world. This is fabulous Bucket List Must Do climb by bike. The other bike climb within a 20 kilometer straight-line radius of the start of this climb is Hoya De La Mora.. Access this other climbs by clicking the "Routes in Area" button below or climb card above right.